"David Elliott is a gifted healer. After my mother passed away, he helped me express my grief in a beautiful and meaningful way. He is dedicated to empowering people with their own sense of spirituality and healing gifts so that we all can access this energy ourselves. He is invested in your own ability to heal yourself from emotional pain or blocks. 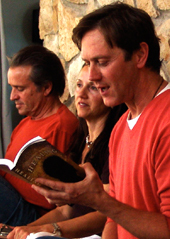 His new book HEALING is a guide and wonderful resource for your journey to healing yourself." "HEALING is an inspiring, heart-centered, believable, and authoritative overview of your power to heal and be healed. David Elliott has plumbed to the core of spiritual transformation, and offers many fascinating case histories and practical exercises. I felt deeply enriched and illuminated by his insights, and I expect readers will find this book a rare and helpful guide." "The message in HEALING is exactly what the world needs now. If everyone read and applied the vital information in this book, the healthcare crisis would end almost instantly." "David has distilled the essence of how to heal: self-love and exchange. In HEALING he outlines practical and specific exercises to realize it." "For those adventurous souls ready to experience full-immersion healing at its deepest level, I suggest you find a comfortable seat, hold on to it, and prepare yourself for a wild and rewarding ride � HEALING is your book!" "I have opened, shifted, and healed my life by working with the message of self-love and exchange contained in HEALING." "HEALING makes it abundantly clear that we are our own healers. David�s message is a timely and much needed prescription." "After years of specialists and rheumatologists, David�s message of self-love is the medicine I choose for my immune system. It works."